With Halloween just around the corner, many of us are looking forward to a long weekend (I know I am! ), however I also know that schools are off and if you’re a working mum it could mean you’re juggling your coaching clients with your kids & trying not to feel guilty about it. Or, you might use the time off to try to catch up with your admin… and then feel guilty for not spending any down time with your partner / family / friends etc. I get it… believe it or not, I’m actually the same, and a lot of my weekends + holiday time is spent in front of my laptop planning my own social media, my blog posts, other marketing, and trying to come up with different ways of standing out in a huge crowd of Virtual Assistants! 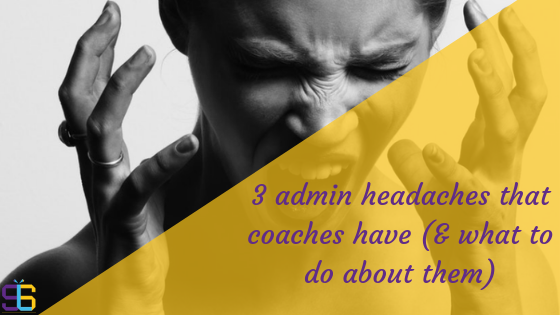 So, I’ve listed below the top 3 “headaches” I know my clients have had in the past, and what you can do to relieve them. Headache 1: Too much to do! 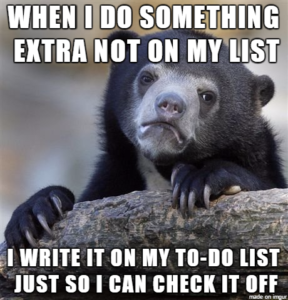 To-do lists are great, I use them daily & I love them! However they are only effective if you actually take action and work through them. If you’re feeling overwhelmed with the amount of “stuff” you have to do, and you’re not getting through your to-do list, try breaking your tasks down further into more manageable bite-sized chunks. Take the time to look at your calendar or diary. Go on and do it now… look at how you’re booking clients in. Are you scheduling coaching appointments back-to-back? Are you leaving time free in your calendar to deal with your admin? Are you the wrong kind of busy? Remember that YOU are in charge of your time – you have nobody to blame but yourself – sorry! The thing with social media is that it can feel like feast or famine! You go through phases of posting something whenever you remember, usually after 8pm for a few nights, and then nothing for a month or so because you’ve got busier, or had some time off. Then you start again and wonder why nobody is interacting with you! When you schedule time in your calendar for tackling your admin (see Headache 1 above! ), make sure one of those tasks is your social media. Schedule your posts in advance, monthly if you can, posting something each day… you can always add to it when you feel like posting something “off the cuff”. There are lots of apps around to help with the scheduling – I use Buffer which costs me just under €9 a month, but their free version is also good. Another mistake people make – actually mistake is too harsh a word, but you know what I mean! – is to try to be active on EVERY social media platform. Think about who you are trying to reach in your business, who your target market is, and then ask yourself which platform they’re likely to be on. It’s more valuable being active on 1 or 2 platforms and doing them really well, than spreading yourself thinly across 4 or 5 platforms. I would say 90% of my clients have had this complaint at some point… and I really feel their pain (and yours) as I used to be the same. It’s worth spending the time putting systems in place now and you’ll soon see what a difference it makes… I promise! When I say systems I mean things like allocating a certain time to read through your emails; setting up filters to deal with incoming emails; setting up an autoresponder to take some pressure off you replying to the emails. Another way to help deal with the dreaded inbox overload is to set up different aliases, for example admin@ / accounts@ / bookings@ etc. and each one can be used for a specific type of email. Then if you want to outsource your emails in the future, the addresses are already set up! The above are just 3 examples of what you can do to help relieve some of the pressures you might be feeling running your coaching business… especially if it is just you in the business.